Sometimes, headlines just write themselves. And in this particular case, there’s so much cool stuff going on with this NASA-funded robotic project that we couldn’t even stuff it all in to a single line. 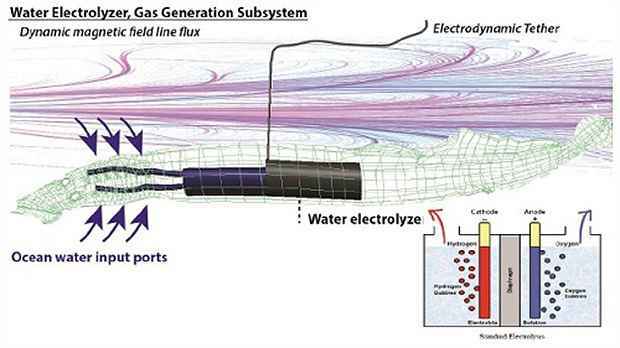 It’s a concept for a soft robotic eel designed to explore the oceans of Europa (a moon of Jupiter), which is able to scavenge electrical energy from magnetic fields, use it to generate oxygen and hydrogen, and then light it off to create an explosion to propel itself. Oh, and it’ll have a soft flexible skin that doubles as “a stretchable, electroluminescent display,” because it’s awesome. And why not. This concept for a “soft-robotic rover with electrodynamic power scavenging” comes from Cornell University, and NASA has awarded it a grant under the NASA Innovative Advanced Concepts (NIAC) program to hoist itself up from TRL 1 to TRL 2. TRLs are “tech readiness levels;” TRL 1 is “basic principles observed and reported” while TRL 2 is “technology concept and/or application formulated.” An actual mission to Europa would involve a system that’s waaay up at TRL 9, so we’ve got a ways to go, but the sheer distance from any sort of practical technological readiness sure does let this robotic eel get away with all kinds of craziness. 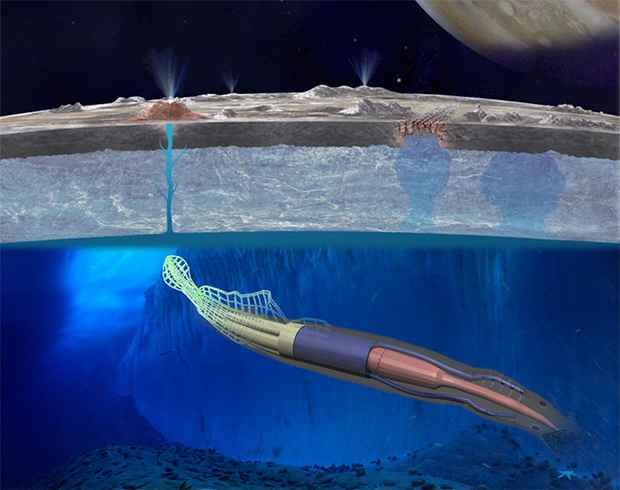 We propose a rover architecture for Europa and other planetary environments where soft robotics enables scientific investigation or human-precursor missions that cannot be accomplished with solar or nuclear power. This rover resembles a squid, with tentacle-like structures that serve both as electrodynamic tethers to harvest power from locally changing magnetic fields and as a means of bio-inspired propulsion. The electrical energy scavenged from the environment powers all rover subsystems, including one that electrolyzes H20. Electrolysis produces a mixture of H2 and O2 gas, which is stored internally in the body and limbs of this rover. Igniting this gas expands these internal chambers, causing shape change to propel the rover through fluid or perhaps along the surface of a planetary body. The problem with solar power is that it’s hard to harvest efficiently as far out in the solar system as Jupiter, and impossible to harvest at all underneath an ice-covered ocean like the one that we think we might find on Europa. Nuclear would be a viable option, except that NASA has postponed or canceled much of the research on small nuclear power sources for interplanetary exploration missions. The last little cool bit is that “the skin of the robot will be a stretchable, electroluminescent display for illuminating the local marine environment, to enable underwater imaging.” Sure! As a concept currently at TRL 1, we’re not expecting to see a prototype of an interplanetary robotic exploration eel for a very long time. 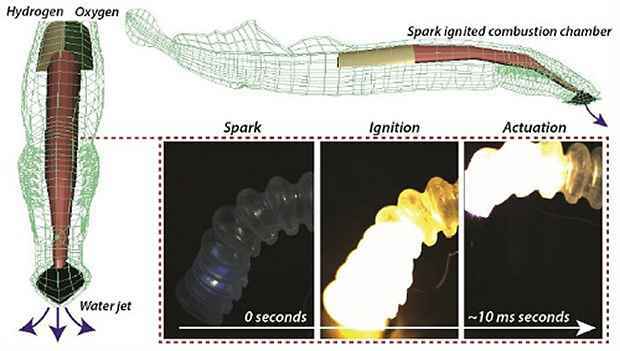 But, that’s not to say that it isn’t a plausible design: soft robots (even soft robot octopuses) are already at the prototype stage, as are explosively-powered soft robots. Really, if you consider this robot as simply a fusion of existing technologies, it’s a lot closer to readiness than it might seem.